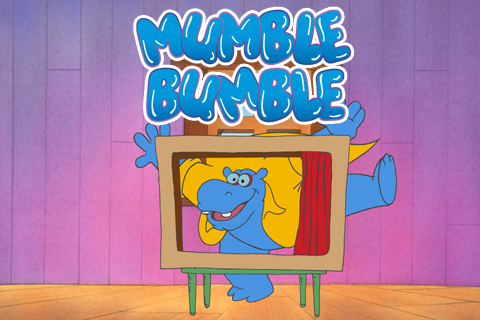 Mumblebumble (often stylized as Mumble Bumble) is a Canadian-Danish animated television series created by Christian Skjøtt and produced by Egmont Imagination, Cookie Jar Entertainment, Knowledge Kids, and CINAR (now DHX Media). The series lasted 65 five minute episodes across 19 seasons and ran on CBC in Canada. Narrated by Harry Standjofski, the series follows the adventures of a blue, happy-go-lucky hippopotamus (the titular MumbleBumble), and his friends, including Chic'o the chicken, and Greens the frog. Other recurring characters include Oink and Roc. As of 2019, only the opening and closing credits have been found, as well as the episode "A Cloudy Day" in both English and Italian. The episode "A Cloudy Day". The closing credits to Mumblebumble.